Once you’ve found a club that runs a program that suits your style of gymnastics, you can keep developing your skills for fun and fitness or increase the challenge by performing on a local, national or even international level. KinderGym – specifically for children under five years to help develop the fundamental movement skills needed for an active, healthy life; learn through exploration, with parents alongside to share the fun. 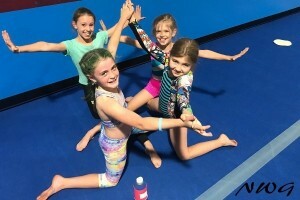 Performance or display gymnastics – a dynamic part of Gymnastics for All with opportunities for gymnasts to show off their skills in group performances from local to international level. Gymnasts of all styles and levels can perform in display events. GymAbility – gymnastics coaches are trained to adapt movements to suit everyone’s needs; if you’re looking for something more specialised, GymAbility classes offer more specific classes to suit all levels of physical and mental ability. TeamGym – an exciting event focussing on performing as a team on floor, tumbling and trampette. Adults Gymnastics – keep fit while challenging your friends in feats of skill and strength. Gentle Gym – classes especially for older adults who want to keep the bodies and brains active in a fun environment. FreeG – anything you want the movement to be and the safest way to develop your style of aerial manoeuvres. The LaunchPad initiative covers fundamental movement activities for children up to 12 years.